A map of Avia and it’s regions, from circa 700 A.N. 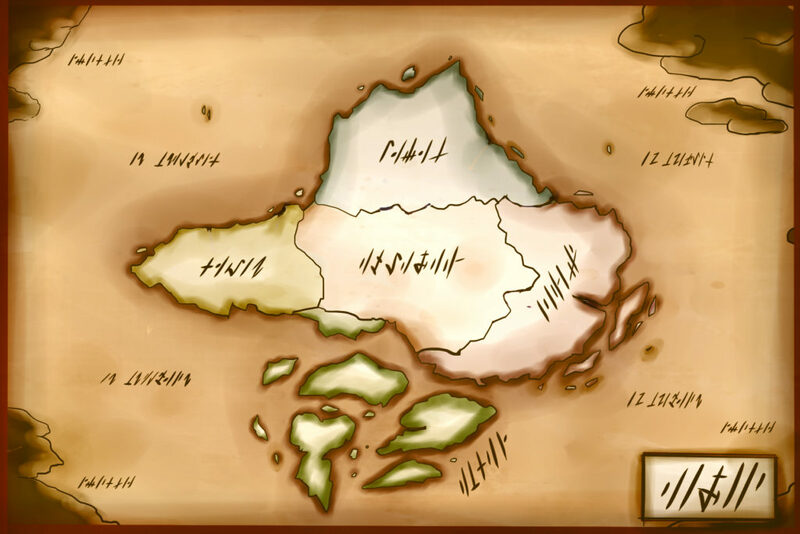 Avia is a large continent located somewhere within the eye of the Nigidesh, and as far as we know, it’s the only place that wasn’t devastated by the great storm. It is host to a large variety of landscapes, ecosystems and, of course, a diversity of flora and fauna that inhabitted long before we avin set foot in it. The name Avia comes from ourselves, of course. It was named after us in honour of our discovery – with help from the Windborn, of course. No signs that any other intelligent races lived here the past were found, so it’s safe to assume we were the first ones to do so. Needless to say, this was once untamed place became home of our now extensive civilization. –Siroon, western region. Land of tall forests and vast flatlands. –Koumul, northern region. A cold and mountainous land. –Xianra, eastern region. Riverine and adorned with valleys. –Oanta, southern region. A massive archipelago of tropical islands. –Havarda, middle region. Once the most splendid, now nothing but an arid and hostile desert.